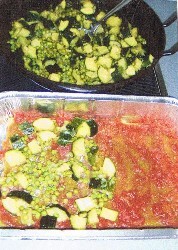 In a frying pan, heat olive oil and sauté red peppers, onion and garlic for 10 min. to medium heat. 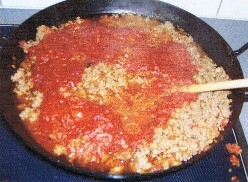 Mix in the ground beef and when cooked, pour in the Spaghetti sauce. Cook for 10 more min. 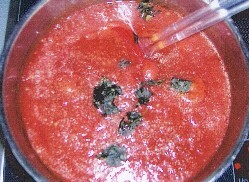 simmer for 30 min. 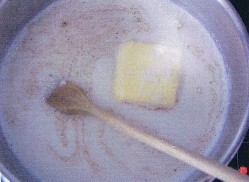 stirring occasionally. for 5 more min. until it thickens. 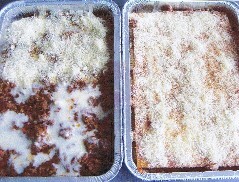 Before starting to arrange the lasagne sheets in its pan, spread some spaghetti sauce on the bottom in order to avoid sticking. 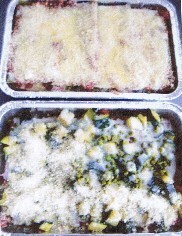 Then lay out the pasta sheets, more spaghetti sauce so previous cooking isn´t necessary, a layer of the meat mixture, Bechamel sauce and cheese. (You can use any for Pizza). 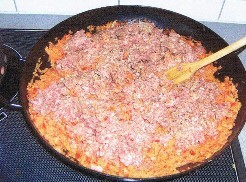 Top with another layer of pasta and continue the same procedure over again. Place in oven to 180° C for about 20-30 min. until is golden brown.